THE bridge connecting Limerick city centre and Corbally is a unique structure as it was constructed mostly with concrete. When the bridge was being built from 1929 to 1931, concrete was plentiful in the city, following the completion of the Ardnacrusha Hydro-electric plant. 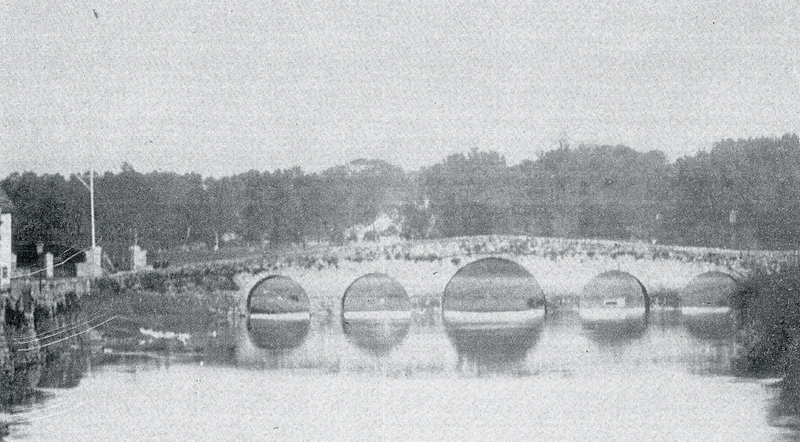 The original bridge that connected Limerick city and Corbally was known as Park Bridge. It contacted at a sharp angle off Sir Harry’s Mall as Athlunkard Street was not constructed until 1824. According to Kevin Hannan in an Old Limerick Journal article this bridge was built by the Vandeleur family in 1798. The Vandeleur family owned a mill in the area. The original bridge was on private property and as such, the leases in Corbally had a stipulation that if the Park Bridge should fall into disrepair they would receive a £2 abatement on their rents. In 1830, a new bridge was built to connect Limerick and Clare over the Shannon River at what was to become the Corbally Road. The famous Pain brothers’ architects, who also designed Thomond Bridge and Baal’s Bridge, designed this bridge. It was named Athlunkard Bridge despite being located 1.5km from the newly opened Athlunkard Street. In the early years, Athlunkard Bridge was a toll bridge and the tollhouse still sits on the Limerick side. As is common today there was an extension on receiving proposals for constructing this road. Plans for a new bridge at the end of Athlunkard Street began in August 1930. It cost a total of £21,308 and over a year to complete. It was dedicated to Dr Edward Thomas O’Dwyer, born 1842 in Tipperary, he was consecrated Bishop of Limerick on 29 June 1886. The Leader recorded on October 3, 1936, “the roads at Park, from O’Dwyer Bridge to the Canal, will be treated with water-bound macadam and tar-spray.” In 1938, the concrete railing was erected on the Corbally side of the bridge after several complains from local residents. The previous railing was made of recycled railway sleepers and several of these had gone missing in the five years since the bridge was completed.